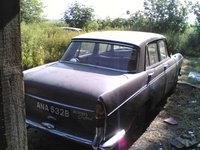 This is myMorris Oxford VI at the start of her restoration project. I'm part way through, with the interior almost finished and the bodywork to do, including inner & outer sills and offside rear wheel-arch. I'm looking for a Smiths clock to complete the interior? I will do my best to keep you informed of my progress. I have driven her a short distance as I live down a farm track so have been able to test the brakes and engine at slow speed. She has had a full brake overhaul, and the engine is rebuilt to run on unleaded. Just out of interest, is there a secret to getting a good seal on the exhaust join between the manifold and the pipe itself? I have had her for nearly a year and a half now but unfortunately when she is done she will be up for sale as I am currently out of work and need the money. She is my first restoration project and I dearly wish I could keep her, but needs must.